Lab-basd research in some of Europe's leading and well-equipped labs for quantum/molecular mechanical calculations, molecular dynamis simulations, chemometrics, pump-probe spectroscopy, mass-spectrometry, non-linear electronic spectroscopy and click chemistry. 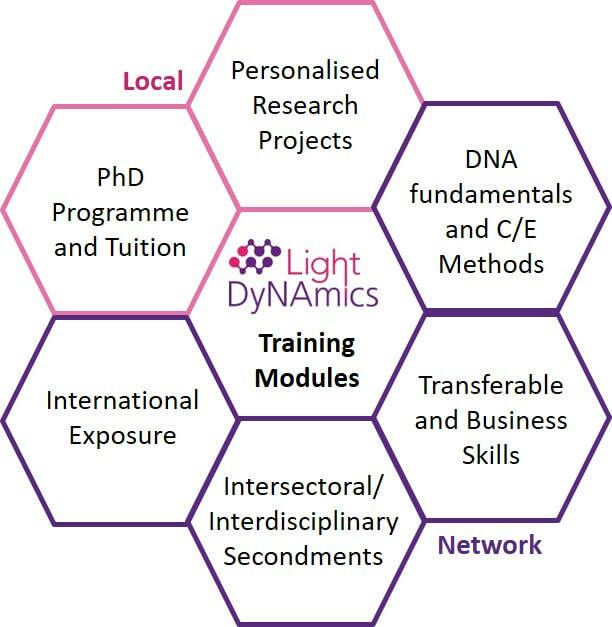 Network-wide events such as the annual LightDyNAmics Weeks with 5 modules and the Technology Training Camps, including scientific, technological and transferable skills training elements. Transferable skills, including complementary technical skills and generic skills, such as IP and innovation management, that will be tailored to the specific needs of the ESRs. International exposure at conferences and Wider Horizon Days to facilitate networking and exchange of knowledge beyond the consortium.